← DCC whistleblowing —what is open government ? Updated post Wed, 18 Mar 2015 at 5:11 p.m.
What if? was quietly advised some weeks ago that another but lesser-sized example of the multimillion-dollar Jacks Point and Luggate shenanigans (read $9m loss to Dunedin ratepayers) by Delta is complicating the city council books. We all know how deeply distressing the Jacks Point Luggate coverup by Dave Cull’s council was – assisted by the Auditor-general and the Serious Fraud Office (SFO) – to the Ratepayers who erupted in disbelief on publication of the Delta investigation. Delta has been involved in another failed subdivision (don’t scream) – the Noble Village Subdivision off Yaldhurst Road, Christchurch (google that) – see Noble Investments Ltd.
It’s on the public record that a bankruptcy is involved. Name: Gordon Ralph Stewart. Check out the New Zealand Companies register. ODT are on the scent. See tomorrow’s newspaper. >> Go to Comment. You know the huge salary that Delta’s so-called “go-getter” earns? We want a lot of that back. Back dated. Past due. Delta is confident of being paid a “significant portion” of a potential bad debt, worth millions of dollars, Dunedin City Holdings Ltd chairman Graham Crombie says. Mr Crombie was commenting after Cr Lee Vandervis said at a Dunedin City Council meeting on Monday the Noble Village subdivision in Christchurch was set to cost Delta a lot of money. I’m not sure I understand the headline on this article “Company is paid money for doing work” is not really a cause for a front page article. The real news of course is that they won’t get paid in full, not that they will be being paid at all – me thinks they doth protest too much …. and being on such shaky ground you can understand why the ODT has disabled comments on that article. That plus it’s also a another stitch up against Lee. Yup. My take too. Delta has been bloody foolish – they have got rid of the ChCh wing that got into trouble with the Yaldhurst deal. Why? Good performance ? And we know about the disaster in Central. This is just spin doctoring. Not good – And natch – they have to stick it to Lee – that almost goes without saying. No comments AGAIN? ODT, why have you become such a “cow’rin, tim’rous beastie, O, what a panic’s in thy breastie”? “…Dunedin’s Delta Utility Services, owed millions on infrastructure work it did on a Christchurch subdivision at Yaldhurst, hopes some of the debt will be repaid. No wonder Delta CEO Grady Cameron is saying nothing. Ditto his board – silence. Only DCHL chair, Graham Crombie has said anything, busily making light of the Noble disaster. So much for open, transparent local Government. I can tell you there is a rising tide of support for Councillor Lee Vandervis and his tireless efforts to expose the less than reasonable public service that seems to prevail within DCC. It’s time some form of public demonstration for Lee was shown that perhaps concides with the LTP hearings due shortly. Ratepayers are still smarting over the desire to raise our rates by 3.8% this coming financial year when inflation is barely 1%. Amazingly there were 2 letters of emphatic support for Lee Vandervis in today’s print ODT, from D Turville who has had a gutsful of Cull & co endlessly bagging him, and Russell Lund who has experienced Lee’s forthright style and survived. In precis, he seems to think Cr Thomson is far more of a girl than Dr Sue Bidrose who doesn’t look to him as if she’s going to be overcome with a fit of the vapours and run away home to spend more time with her crochet doilies. Disclaimer: I have no accurate information about crochet doilies in the Bidrose household. It was a wild guess. The double-take necessary with the Delta headline at ODT was really messed with by comments not allowed. ODT this week, in particular, have SO MUCH TO HIDE, SO MUCH FAITH TO DESTROY, AND NOW THEY ARE COMPLETELY OPEN ABOUT IT. Corruption is more than editorial correction and control, at ODT it’s Ebola to Dunedin’s democracy. Deathly, so stupid and so unnecessary. But by now even the ODT managers and senior clinicians are showing symptoms themselves, caused by their utter lack of stringent health care, investment and prevention. Their extreme dereliction. Once again it is left to Cr Vandervis to express concern at the activities of Delta and its financial indiscretions. Chairman Graham Crombie endeavours to put ‘lipstick on the pig’ by claiming that he expects to recover “a significant portion of millions” owed by a developer of a subdivision in dispute at Yaldhurst Christchurch. Again, Cr Richard Thomson makes his vindictive comment calling Cr Vandervis for “raising the matter in his usual reckless way”. This rightfully so, prompted a ‘point of order’ from Cr Vandervis which resulted in Mr Cull telling Cr Thomson to withdraw the comment, saying “reckless” was only “one” way in which Cr Vandervis expressed himself. This in itself is saying in effect, that whilst he agreed with Cr Thomson it was best left unsaid. Cr Thomson seems infatuated with his loathing of Cr Vandervis’ strength of arguments, but only seems able to filter through that ridiculous moustache the ‘miasma of turpitude’ existing within that chamber. In a word, the man is a fool. The old saying Calvin, ‘a fool and his money soon part’. In this case all $16 million of it. Cr Vandervis expresses concern at the activities of Delta and its financial indiscretions. Cr Richard Thomson makes his vindictive comment calling Cr Vandervis for “raising the matter in his usual reckless way”. If nobody mentioned it, it wouldn’t be real, Cr Thomson knows that. He knew the health dollars were safe till someone recklessly exposed Swann’s activities. Richard and his chums weren’t going to upset apple carts by wondering how a chap on that salary could afford so many super toys. Clap hands if you believe in fairies. Further to my previous comment I wish to put Cr Lee Vandervis’s whistleblowing comments into a very important perspective to demonstrate how important he is to keeping local body democracy” barely alive” in Dunedin. Recently my good friend Peter Atwooll wrote a letter to the ODT (11.3.15) asking just why the self-imposed rates rise limit of 3% had been suddenly abandoned in the new draft LTP for 2015/2016. The reply he got from Grant Mckenzie (DCC Group Chief Financial Officer) was most revealing. Apparently the two reasons for the proposed increase is: 1. A different way of funding the Forsyth Barr Stadium (in other words more rates subsidy) and 2. Reduced income from Dunedin City Holdings Ltd which “owns” all the DCC Companies. So for Delta Utility Services (as one of those Companies) to be compelled to admit it is owed millions of dollars on a Christchurch subdivision is to tell us that it is certainly contributing to the “reduced dividend” forecast; and ratepayers as the ultimate owners of these Companies have a right to know why the income flow to DCC coffers will be down. The other reason for the proposed increase is the proposal to give more rates money to the Stadium arising from the November 2014 Review. This Review as Cr Vandervis has publicly pointed out was heavily weighted in favour of DVML people and came out with its recommendation for the DVML to remain and further DCC subsidy, on the premise that the economic benefit of the Stadium to Dunedin was $60M. However the authors of this Review recommended caution in applying this estimate because it was based on limited information and, significantly, a recommendation for more accurate data to be compiled was made. Here is the irritant for me. Despite numerous email requests to DCC including the CEO and Cr Calvert – no-one, but no-one has bothered to reply to my question whether or not this important data collection exercise has in fact been carried out. Given that the draft budget has been set for the 2015/16 year you would think that such a task as verifying the economic return of the Stadium would be finished by now and in time for the forthcoming Annual Plan Hearings. But no – a deafening silence. That’s why we still need our good friend Councillor Lee Vandervis to ask questions like this on our behalf around the Council Table. There is sadly no-one else who cares. Clearly a little Google search on Noble in Christchurch reveals a great deal. Their solitary director seems to have been linked to more companies than you can shake a stick at – page after page after page of mainly struck-off companies. While the issues at this particular development seem to be extremely serious with all sorts of legal action being taken by all sorts of people, it does not appear clear at all that Delta’s costs are necessarily protected. What concerns me is that this sort of exposure seems to have been known by a few but not amongst all our Councillors – and Delta is simply part of the ratepayer’s bundle of interests. I can’t see why the information on a potential bad debt running into millions should be kept to the few particularly when the track record of Delta losing money is concerned. What concerns me equally is yet more displays of dysfunctionality at the DCC. The reported comments, if correct, are nothing short of disgraceful and not becoming of anyone supposedly running a City. The ODT appears to be complicit. Yes, I had a look there too. Not a pretty picture and the sole director has a lot of questionable activity going back a long time that should have been a red flag for anyone. So much to be said then, for the business acumen of Delta and the DCC. Then we get this stuff from the Council last night. Dunedin Mayor Dave Cull said the matter was not in the public domain, and Cr. Vandervis should not have been talking about it at the meeting. The debacle about the Yaldhurst subdivision and Delta’s involvement with is well and truly public knowledge. Just the extent of the loss is not yet known as far as I can tell. So wtf. After Jacks Point, people were asking what was being done to avert a similar outcome in the Noble subdivision, Cr Vandervis said. Again I worry about the Mayor. Both the Jacks Point and Yaldhurst ventures of Delta were ill-conceived business ventures that have resulted in loss of revenue to the company and in consequence the ratepayer. What part of that does the Mayor not understand? Reckless? That is pretty rich coming from this person. Cr Vandervis was doing the whistleblower job – something that Richard Thomson was sorely in need of a few years ago at the DHB and something that he was pontificating upon only a few hours ago. This and the rest of the report in the ODT truly does reveal the dysfunctionality at the DCC. The ODT complicit? Nah it has Cull and the DCC pwned! For those who thought this was a spelling mistake at the bottom of my last post I provide this for your amusement – we surely need a bit! A corruption of the word “Owned”. This originated in an online game called Warcraft, where a map designer misspelled “owned”. When the computer beat a player, it was supposed to say, so-and-so “has been owned”. Instead, it said, so-and-so “has been pwned”. I seem to remember Dave Cull not so long ago referring to ex DCHL and Delta director Mike Coburn, Jacks Point man, and member of the Stadium Delivery Project team as ‘a bloody good bloke’….or words to that effect. They later had to ease Coburn out. No questions asked of course because they had the answers provided for them. You need to be a good, intuitive judge of people to be a real leader. Sole director with pages of struck off companies? l would have thought that would ring warning bells for Delta. This comes across as incompetence at best with Mr Transparency’s Council once again bitching about Lee Vandervis being transparent to the public. Ok…..how many millions are we talking about as a potential loss? The public have a right to know. Didn’t the CEO of Delta get some big award some time ago ? Can anybody recall what it was for. Sep 8, 2014 -Aurora Energy and Delta chief executive Grady Cameron was … Energy Executive of the Year at the Deloitte Energy Excellence Awards. ….. 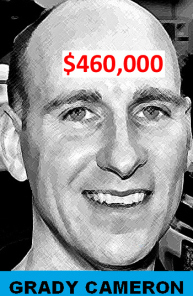 He might have won a GOB back-scratchers’ award but the guy is an utter failure for Delta Utilities Ltd, Dunedin City Holdings Ltd, Dunedin City Council, and of course Dunedin City Treasury Ltd – and is paid more than the DCC Chief Executive. HOW DO WE LOSE HIM, FAST. For not losing quite as much money as he could have? It must be very embarrassing for Dave Cull’s team (including the Grater Dunedin members, Allied Press and senior DCC staff) to have a genuine whistle-blower to show up just as the team announced their fake whistle-blower policy yesterday (http://www.odt.co.nz/news/dunedin/336438/council-sets-whistleblower-committee). The article says: Cr Lee Vandervis asked how easy it would be for the general public to tip off the council’s whistleblower, given he was “beginning to tire of the role, given recent events” . It is clear to me that only Cr Vandervis has been able to publicise some very serious matters that would not otherwise have penetrated the collaborative stone-walling efforts of Allied Press and the DCC staff and Mayor Cull and his cling-ons. Murray Kirkness (ODT Editor) needs to explain why this Noble Investments cover-up story reads like a DCC press release from the DCC’s well funded spin doctoring team. In the ODT, everything about the DCC is good news, it seems. Both halves full, is how Murray likes it. The ODT says the director of Noble Investments could not be reached. Will they try again? Not if it is the ODT. Unless they are pursuing someone they don’t like and think they can do a twisted story on that person. Is he overseas? Does he have a cell phone with a ‘please leave a message’ and an email address for a response? A check of the business and home address would not be unreasonable either given the potential millions lost. Has this been done by DCHL? I’m sorry but l think Richard Thomson and Kate Wilson….by coincidence….smothering Sue Bidrose in love….we might lose her if Cr Vandervis continues to be so horrid….is manipulative. The same thing happened with some opponents of the stadium who spoke at the Town Hall meeting. Farry was an exemplar of this technique. The idea is you draw key people into your bosom so they feel obligated to you and serve your needs. Hopefully Sue Bidrose doesn’t fall for this, lose her authority and respect as an independent CEO working for all. As others have pointed out she is actually being condescended to as some girly bit of fluff who might run away in tears. Mon, 16 Mar 2015 at 11:17 p.m. I attended part of the Cr Vandervis code of conduct hearing today out of curiosity. I left soon after he walked out of the hearing after the first matter. He advised Prof Anderson that he wanted the subsequent allegations in writing so he could respond fully to them and not be ambushed. He suggested an adjournment until this was done. He stated there had been many versions of his alleged behaviour. He effectively invited his accusers to pick a version and run with it. This seemed a reasonable request, and Prof Anderson agreed that there was “an element” to his point, but chose to continue the hearing anyway. It did not appear to me that Prof Anderson had a full grasp of the proceedings. Prof Anderson actually said that this was not a court so procedure wasn’t important…. This, for a complaint about someone raising his voice ! Last year I experienced Cr Vandervis’ debating style, having been subjected to quite a grilling from him at the NZ Loan and Mercantile Building resource consent hearing, that some present considered aggressive and out of order. However, I bore Cr Vandervis no malice and I was keen to see just what all the fuss was about. I have to say it was not a good reflection on Council. Cr Thomson spoke at length after Cr Vandervis left Monday’s hearing. It was clear that Cr Thomson is a very smooth talker and Cr Vandervis is not. Cr Thomson confirmed several times that it was not what Cr Vandervis had said, it was the way he said it. Cr Thomson said it was intimidating and bullying behaviour. When questioned further, it transpired that what this actually meant was Cr Vandervis had stood up at his table and was “red in the face” and spoke very loudly, and then left the meeting. It transpired that Cr Vandervis was not actually at the meeting table, ie not physically close to the person he was addressing (Ms Johnstone), but some distance away at another table. Cr Thomson then made the remarkable statement that he was concerned that CEO Bidrose might leave the council because the way Cr Vandervis spoke to her, and the city would never find anybody as good as her. I agree that CEO Bidrose is an asset to the city, and is steadily repairing the damage overseen by a previous CEO. But Ms Bidrose is no shrinking violet and doesn’t need Cr Thomson as her white knight. I have found Ms Bidrose to be passionate about Dunedin, and my very limited experience of Cr Vandervis is the same. It should be remembered that Cr Vandervis was provoked to anger because he wanted a full police investigation regarding corruption in the DCC. I can understand why he was frustrated because as Ms Bidrose has herself acknowledged, Audit NZ were looking at the DCC very closely, and were not far from considering some aspects of DCC operations to be incompetent. Full transparency and a full investigation as sought by Cr Vandervis would show that the city was serious about fixing its many problems. I can understand why Cr Vandervis lost patience and wasn’t able to play nicely…. Excellent letter by Russell Lund. He is fair with a good intuitive grasp of the main players and what drives them. He has earnt my respect. Thank you for publishing Russell Lund’s comment here as it provides us all an independent and unbiased account of that affair. His observations of Crs Thomson and Vandervis – particularly this, “Cr Thomson spoke at length after Cr Vandervis left Monday’s hearing. It was clear that Cr Thomson is a very smooth talker and Cr Vandervis is not.” – were telling and in the case of Thomson – yes he would have gone on at length (undoubtedly tiresomely) but I would not have chosen the adjective ‘smooth’. Why am I thinking Weasel? Anyway, his letter to the paper will be good for the public to read and it might even give Cull and Thomson pause to consider their actions. Nah – they don’t possess the goods for that. ● For more, enter the terms *vandervis* and *citifleet* in the search box at right. The Standing Orders set out rules for the conduct meetings of the Dunedin City Council and includes the Code of Conduct for Elected Members, as adopted at the inaugural Council meeting Oct 2010. This document details the constitution of the Council, Committees and Subcommittees, and the delegations to the Chief Executive. OMG, long-distance terrorising by voice-power! String him up! “it transpired that what this actually meant was Cr Vandervis had stood up at his table and was “red in the face” and spoke very loudly” – red-faced too, a commie sympathiser. Pull his fingernails out first, then string him up. Cr Thomson’s right in his calm understated way, trying not to spread panic. The fact of the matter is that none of us is safe not even in our own homes while this loud pinko is free to roam the streets. Not that we’re all that secure in our own homes anyway, not the way the Council keeps on increasing the city’s debt using us for security. Houses, kidneys … and the only one who seems bothered by this is (wait for it) Cr Lee Vandervis. Perhaps he’s not all that bad after all. If Russell Lund’s telling of events are as he outlines (as compared to ODT’s truncated version) then it could be said that Cr Richard Thomson’s charges are a perversion of the truth. The backing of the claims by Mayor Cull compounds the damage to Cr Vandervis, who could be entitled to lay a defamation suit at the feet of Thomson, Cull and Staynes. If nothing else, it would be poetic justice. I can corroborate Russell Lund’s account from my (unreleased) hearing notes. █ For more, enter the terms *vandervis*, *citifleet* and *delta* in the search box at right. Coneburn’s sole director, Donald Fletcher […] is one of the original partners in Jacks Point along with developer John Darby and Hong Kong listed investment holding company Sea Holdings. An Environment Court order has cleared the way for a Jacks Point subdivision after five years of wrangling. The order means developer Coneburn Planning Ltd can proceed with the subdivision of a 7360sq m site in the Terraces area of the resort village near Queenstown. It resolves the company’s appeal, lodged in 2010, of a Queenstown Lakes District Council decision to decline a resource consent application for the subdivision. The Office of the Auditor-general considers its investigation into land purchases by Dunedin City Council-owned company Delta to be one of its major inquiries for the coming year. Results of the investigation might not be made public for some months, at the earliest. The OAG’s draft annual plan for the 2013-14 year, published last week, detailed work planned for the 12 months from July 1. The plan listed the Delta investigation as one of the “major inquiries” to be reported on during the year. The investigation into Delta’s $14.12 million land purchases in 2008 and 2009 at Luggate, near Wanaka, and Jacks Point, near Queenstown, was confirmed last November.